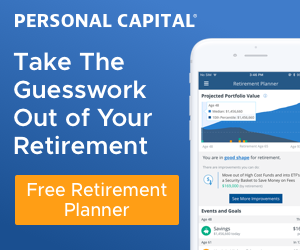 Should I be concerned that my credit score dropped recently? I mean, after all, your credit score helps financial institutions define your reliability in the world of finance. It’s like your report card to see how you’re doing. A great score likely means you’ll get better rates when applying for a loan. A bad credit score usually equates to a higher rate – if you’re able to get approved at all. I’ve always maintained a good score, even when I was in deep consumer debt back in the college years. Even though I had a lot of credit card debt, I was still paying at least the minimum every month. Back when balance transfers were big with the credit card companies, I actually had a year or so where I would pay my MasterCard with my Visa. Then the next month I would do the opposite. I did that almost every month. Thinking back, it was a crazy strategy, but it bought me some time. I eventually started to make a little money where I could chip away at the debt over time. But the important thing was that I never actually missed a payment deadline so my credit score stayed pretty good. Over the next couple of decades, I’ve just always paid my bills on time. Once I was out of credit card debt, I was freaked out (rightfully so) and have always paid my monthly balance in full ever since. So, year after year, my score got better and better… until recently. That’s when my credit score dropped and made me wonder if I should be concerned. 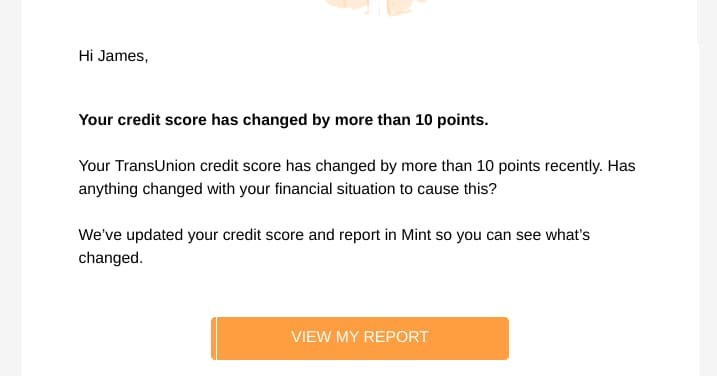 We should probably mention the difference between credit scores such as VantageScore and your actual FICO score. A lot of providers such as Credit Karma, Credit Sesame, and Mint provide you with a free credit score. Though these are definitely helpful to get a gauge of where your credit score is, they’re not the “big guy” in the financial realm. 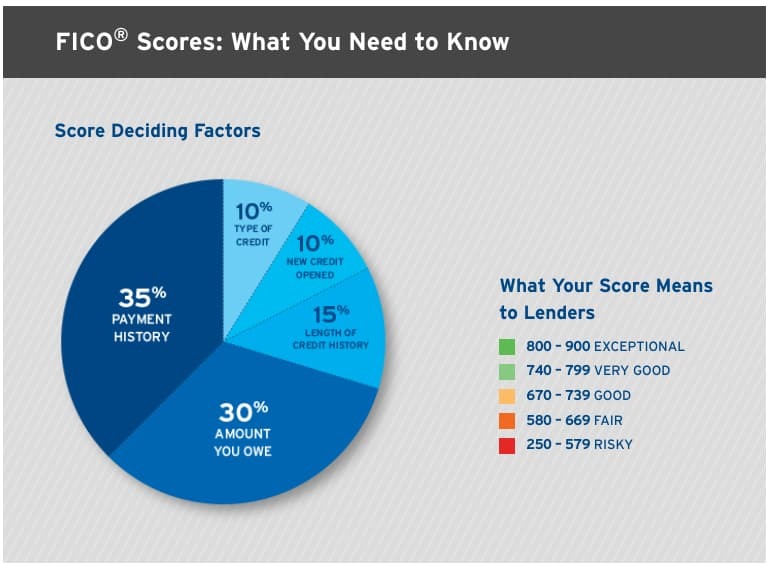 Your FICO score is the one that most lenders actual use when determining if you’re a good candidate for a loan or credit. It’s also one that, until recently, you needed to pay to receive from the Fair Isaac Corporation. Over time, more services such as Credit Karma have crept up and started giving away this kind of information for free. This put a little pressure on other financial institutions. They want you staying in their ecosystem and not relying on outside services. So over the past couple of years, several places are starting to provide your actual FICO score to you for free as an added benefit. That might be your credit card, bank, or credit union. Credit scores like VantageScore can be helpful for you to get an idea of where you stand on a regular basis. However, if you’re planning on making a major purchase such as a house, you should probably check your actual FICO score to see how you’re doing. The reason is, although most credit scores will put you in a pretty good ballpark, they can still be off by a number of points. And those points could mean a big difference when your lender determines your rate. So you want to make sure your score is as high you think it is or build it up if not. Uh-oh, my credit score dropped… quite a bit! With us moving to Panama in a few months, we started a mission at the beginning of last year. We decided to focus on travel rewards to build up and bank miles and points to be able to use for flights back and forth and throughout the U.S. when we visited. First off, know that this has been wonderful. I feel like we missed out in taking advantage of this hidden treasure for all these years. In just over a year, we’ve accumulated massive amounts of points and miles saving us thousands of dollars in travel. On top of that, we should be receiving the coveted Southwest Companion Pass when my credit card statement closes in a few weeks. This will be good for the rest of this year and all of next. Shout-out to Brad and Jonathan from ChooseFI for turning me onto understanding how valuable travel rewards can be! Now, we also knew going into this that our credit scores would change a little bit as we did this. In the beginning, I think our scores started to go up because the formula they use liked that we had more available credit to our names that wasn’t being utilized. My credit score dropped? Hmm, what’s going on? Don’t forget, though, this is my VantageScore and not my FICO score. 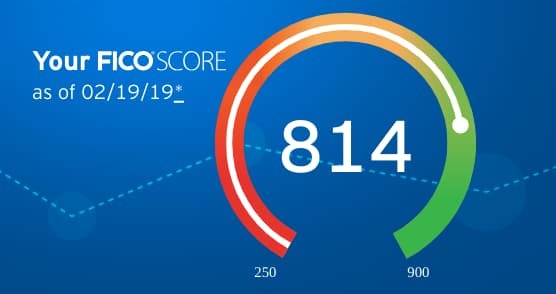 It looks like my FICO score is pretty much right in the middle of my TransUnion and Equifax VantageScore numbers… so the Mint numbers really aren’t too far off. An 814 – yup. That’s nice. I have no idea if my score went up or down because I never really check it. For point #2, it’s like Citibank was reading my mind. Sure enough, they keep track of the trend on my credit score for me… ain’t they sweet?! Fair enough. I’m not sure about that first one considering we sold our house last October (though we still own a duplex for a rental property). And, like I mentioned, we pay off our credit card balances every month. But that second point makes sense based on what we’ve been doing. I’ll be the first to say that I’m guilty of not keep track of my credit score. I mean, I’ve known it’s been somewhere over 800 for a number of years, but that’s about it. But do I really care that my credit score has dropped? It reminds me of the certification exams that I used to take as an engineer in the IT field… Microsoft, Cisco, etc. These are a regular part of the job. Some of the certifications were necessary for the company to maintain certain authorizations as a partner. But the majority of the training and exams were to help become more proficient at the job. Boy, I miss the fun of studying for those tests. Ah, the good old days! You don’t really believe that, do you? But let’s say that a certification exam had a passing score of 825 out of 1000 points. I’m sure that just meant that you need 82.5% to pass, but who am I to simplify things for these companies? Anyway, if one of our engineers would get an 825 on the nose, we’d call it perfect and tell ’em congrats! On the other hand, if someone got a perfect score (or close to it), we’d jokingly tell them they studied too much. Get the point? Anything over the 825 is irrelevant – you’re good to go once you hit that number. So, my score is “exceptional” – I like that! It sounds very prestigious! As a side note, 750-850 is considered excellent with a VantageScore. Here’s the deal, though – anything in that range is great. You don’t get extra credit for having an 875 versus an 825. So guess what – my 814 still rocks! I should get a crown or something! On top of that, we’re done with the travel rewards. That Southwest Companion Pass I mentioned earlier… that was the last goal for the time being. That means we won’t be opening any new credit cards which should “stop the bleeding.” And then, we’ll be closing cards that have annual fees as they come up for renewal. That should help build things back up a little. We don’t need the fantastic credit score (at least for the time being). We’re moving to Panama soon. And if we decide to buy a house there at some point down the line, it’s not a big deal. Panamanian banks don’t look at credit reports from your home country. 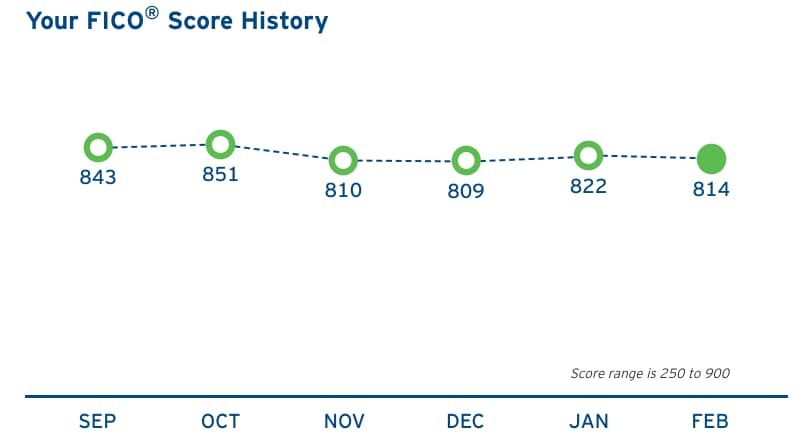 So my credit score dropping over the past year… not a big deal in life. Now, if circumstances were different and we planned on applying for a mortgage or car loan in the near future, this would make me start paying a little more attention. It’s possible that my score can come into play if we decide to move back to the States and buy a home in the next couple of years. But for now, no, I’m not worried in the least. Has your credit score dropped significantly at any point? If so, were you worried or did you just shrug it off? I would only be worried if I didn’t know why my score dropped… I wonder whether this will matter much for you given your move. I’ve never thought about how credit is handled in other countries. I find conflicting info out there about whether or not your US credit score is used when getting a mortgage in Panama. However, we don’t plan to buy for at least a year – if we decide to buy at all there – so that should give me some time to let my score build back up. My credit score fluctuates b/c I use my HELOC to smooth out our expenses, and this can move my outstanding balances up and down. It’s only an issue if I’m applying for a debt. Otherwise, I just make sure it’s high enough and that I always understand why it moves, if at all. Good luck on the move to Panama! We have places in Costa Rica, so we’ll be neighbors (although we’re in the northern part closer to Nicaragua). We actually have some friends that live near Playa Grande in Costa Rica – is that close to where you have a place? My brother and sister-in-law were just over there visiting them. Just out of curiosity, do you know if your credit score means anything when applying for a loan in Costa Rica? Playa Grande is the next beach over, and you can walk there during low tide, but we haven’t done that yet. So yes it’s close — just a few minutes by car. As for credit score and Costa Rica financing, we didn’t try to get financing. Rates are much higher than in the US so it wasn’t worth exploring. I think you need to be a resident to qualify for financing anyway. We ended up doing a cash-out refi of another rental property in the US to give us the cash to close in Costa Rica. Hope that helps! Good info – thanks, Caroline! 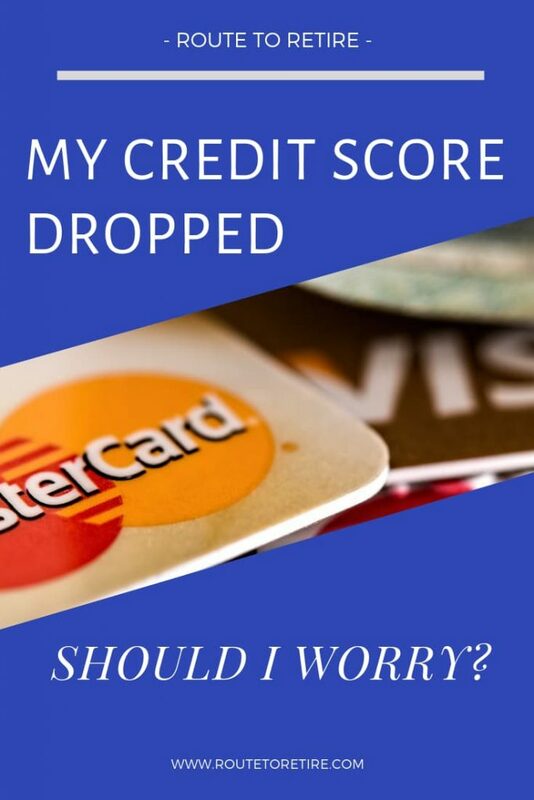 Hi Jim – to answer your question of “My Credit Score Dropped – Should I Worry?” – I think it depends. It depends if you need credit or not. If you have no need for credit, I don’t think credit score matters much. If your house is fully paid off, you buy your car with cash, and you already have a credit card with a limit you will never come close to hitting, then a low or high credit score should have little impact on you. But I think for the majority of people, having good credit is important because they need to borrow. Why pay more interest on borrowed money than you have to because of a poor credit score. My credit score dropped recently for a missed mortgage payment on one of my rental properties. I just completed a recast with the lender and they screwed up my new payment amount. I called the lender to ask them to fix it. They fixed the amount but it crossed a payment period. Even though it was the lender’s fault, they still reported the late payment to the credit agent. My score went down because of that. I am still upset over it because I want to re-fi a few mortgages I have given the attractive pricing right now. Hopefully, I am still in the excellent bucket after the drop and it won’t affect my pricing much. Ouch, that hurts on the rental property payment. Fingers crossed on your current score for the refinances- rates have dropped to the lowest they’ve been in a while. I usually pay big ticket items in cash so a credit score doesn’t impact me as much. If I want to access capital at a lower cost, I’ll just structure an asset backed loan. This is one way around worrying about credit scores. Am I wrong to assume that having a solid payment history is more important than if you owe a large amount of money? What I’m trying to say is, if you’ve proved you can pay it off, but this time the amount is larger, will they see your track record and judge you as someone who can pay it off? According to CreditCards.com, your payment history comprises 35% of the total credit score and credit utilization makes up 30%. So it looks like a combination of both, but your payment history carries a little more weight in the score.